Notes: Tribunal:Quest Items was flat-out wrong about almost every single item. The details have been verified afresh (by Darklocq) and both pages corrected. Help a band of rebels in the Vacant Manor kill and take valuable items from local nobles. Enter the bottom floor of the Vacant Manor. Speak to Dovor Oren about business. Return to Dovor Oren for a reward. Speak to Dovor about assist, then to Felvan Ienith. Return to Felvan Ienith for a reward. Speak to Dovor Oren about assist again, then to Olvyne Dobar. Return to Olvyne Dobar for a reward. Speak to Dovor Oren about assist again. Return to Dovor Oren for the final reward. Follow the above until rewarded for the death of Elanande. Speak to Felvan Ienith about Scared and tell him to turn himself in. Speak to Olvyne Dobar about Scared and tell her to turn herself in. Speak to them again in jail, to close the quest. Dovor Oren will turn up dead, and the Vacant Manor is effectively yours. Agree to help Dovor Oren, then just kill him when he tries to enlist you to murder and steal for him. Optionally kill his entire gang, if you want the Vacant Manor (the quest is closed by killing Dovor). A variant consistent with a Thieves Guild and/or Morag Tong double-agent infiltration of this group is to do their deeds, take their money, then eliminate them as amateur, "non-union" competition. If you agree to help in this "business", Dovor says you should be able to find Soscean in his usual bar, presumably The Winged Guar, since that is the only pub in the area. Indeed, you'll find him there, downstairs, wearing his precious and aptly named Soscean's Cuirass. Sometimes he will spawn into one of the storage rooms, so if you cannot see him, check there (using the usual tricks to avoid arrest for lock-picking). Unfortunately, he won't respond to any dialogue, so the only option is to kill him (use a Frenzy Humanoid spell, or shut yourself inside a storage room with him, to avoid a Bounty for murder). A strong Chameleon effect, or strong Sneak skill combined with an attack that kills him in a single strike, are also options to avoid a murder charge, but are less reliable. Soscean (and the other, later, targets) have equipped the items the so-called Warlords desire, thus they cannot be pickpocketed for them. Return to Dovor and give him Soscean's Shortsword and Cuirass to receive a 5,000 gold reward and the option of performing more such work for his group. The total nominal value of these items is actually 43,000. Soscean's Cuirass verges on priceless for any user of Heavy-class armor, however. It is an Ebony Cuirass with a unique Constant Effect of Fortify Health +50, making it one of the best armor items in the game (the various Artifact cuirasses do not have such general-defense enchantments, and provide unusually good protection only against specific attacks like Fire or Magicka). The +50 provided by Soscean's Cuirass greatly exceeds the power of a custom-enchanted Ebony Cuirass, which will top out at just +8 (even the Daedric Cuirass, with a better base Armor Rating at the cost of much greater weight, can only do +12, and is the most player-enchantable cuirass available). The Ebony Shortsword lifted from Soscean has a weak Disintegrate Armor enchantment of little use to a player character, since most fights do not last long enough for it to make a real difference, and it results in loot that has to be repaired more to net a good sale price. This destructive magic, however, is a good reason to kill Soscean as quickly as possible if your own Armorer skill is poor, since you'd have to pay more for repairs. After the above "hit" has been performed and rewarded, mention to Dovor Oren that you wish to assist him again, and he'll tell you to talk with Felvan in the same room. Felvan Ienith is looking for some new equipment; he would like the Extravagant Robe and the Ebony War Axe carried by Elanande in Godsreach. She can be found in the northwest corner of that district, by the canal. Like Soscean, she will not talk with you, forcing you to kill her to retrieve the items (use Frenzy to avoid a murder charge; the Sneak trick is even less reliable in a space this public). Return to Ienith with the items and receive 1,000 gold as a reward. Elanande's goodies have a total list value of 15,050, mostly from the axe, which does a rather routine Drain Health 5 points for 1 second. Her robe has a low sale value of 50 gold, yet is among the strongest Chameleon items in the game (70 to 100% for 10 seconds). After Ienith pays you for taking out Elanande,, speak to Dovor Oren and offer to assist again. This time it is Olvyne Dobar he directs you to speak with, standing next to Dovor. Olvyne asks you to kill Bels Uvenim, who hangs around the temple, and to return with his Silver Spear and his Imperial Silver Helm. Bels can be found in the northwest side of the Temple and again will not talk to you, forcing his death in the end. Return to Olvyne with the items and receive 1,000 gold as a reward. The items are low-value (worth a combined 620 gold). The helm does a useful but rather "wild" 10 to 30 foot Detect Enchantment for 30 seconds. The spear's Demoralize Humanoid and Creature enchantment (an unreliable 1 to 20 points for a short 10 seconds) is of little interest to player characters (except ones too weak to be performing this quest to begin with), since it would make combat harder to complete, with enemies running away, maybe and only briefly, then coming right back. A potential use for it, however, is as the emergency melee weapon by someone who favors ranged attacks, to get enemies to back off and receive one. Speak to Dovor Oren once more, after completing the Bels Uvenim job, and offer to assist again. For this last hit, Dovor directs you to kill one Suldreni Salandas and return with his amulet and his mace. This time, the victim is found wandering on the west side of the Great Bazaar. Return to Dovor with these items, and you will receive a 4,000 gold reward. The items have a combined value of only 490 septims. Yet the amulet is one of the few available items that provides Fortify Attack (a notable 5 to 20 points for 30 seconds), and also does Fortify Skill Blunt Weapon 1 to 10 points for an inconsistent 20 seconds. The mace is enchanted to Frenzy Humanoid and Creature 1 to 10 points for 10 seconds. This is much less useful than it sounds, for at least four reasons: A) The effect is wildly variable and weak. B) It is too short-lived to cause multiple attackers to turn on each other more than very rarely (and they're already "frenzied" enough to be attacking you or will be anyway after you hit them with any attack). C) It is Cast When Strikes, rather than Cast When Used, so the effect is cast every single strike even when the intended (but faulty) result might not be desirable, and will thus also drain the weapon's charges very rapidly; and D) it does not help at all with the most common use of Frenzy Humanoid (to cause someone to attack you so you can avoid a bounty) – you'd still have to hit them first, per "When Strikes". After killing Elanande, it is possible for you to speak with Felvan Ienith about scared. He will confess that he is unsure whether what they are doing is right. It then becomes possible to have a similar conversation with Olvyne Dobar. If you so choose, you can urge them to turn themselves in to the guards. If you do this, then you can later find them in cells in the Royal Palace jail. Speak with them to receive their thanks for helping them do the right thing. This conversation actually needs to happen to close the quest in your journal, if you've gone the "stopping the murders" route. They will also have killed Dovor Oren and left his body in the Vacant Manor, still wearing the valuable gear you gave him. You can then use this building as a player home, as long as you identify which containers are "owned" (and would thus flag anything put into and removed from them as "stolen"). Many containers in the place are not owned. If you like, you can remove the owned ones with the Disable command in the Console. Killing Dovor Oren himself will formally end this quest abruptly (or prevent it ever starting). If you're Fighter's Guild, Imperial Legion, a roleplayer with a penchant for vigilantism, or just consider your character deputized (given how frequently various governmental personages have you do their policing), you may wish to begin this quest as an undercover ruse, then eliminate this den of murderous thieves posing as revolutionaries as soon as they reveal what they're really up to, without you doing any of the murders for them. This avoids the problem of having to do two of the murders before anyone's scripted conscience kicks in (and before your own would otherwise be allowed to once the quest has started). It also gets around the problem that the game provides no way to report this group to any authorities. If you slay this entire gang (which will not lead to a murder charge, while if you attack Dovor or any of them they will all fight you), you will still also get control of the now actually-Vacant Manor (aside from some "owned" containers; see above), plus all the loot of this supposedly political but seemingly just covetous gang. Another option is to deal with Dovor, alone, via Frenzy Humanoid (which will not trigger the others to fight), then walk away. After all, no one at this point but Dovor has suggested you do anything illegal. The quest will be closed in your journal with the death of Dovor alone. A more profitable, and ruthless, approach is to perform this "wetwork" stepwise and get paid by the conspirators for each hit, then kill them, too (for their gear and that of their/your victims), and take over the manor. A Thieves Guild and/or Morag Tong roleplayer could consider it infiltrating, verifying the depth of the unsanctioned activities of, then firmly eliminating some non-guildmember competition in the grand larceny and politicized assassination businesses. If you don't care about roleplay, the 11,000 gold in total payment from the "Warlords", or the junk items, and don't mind wandering a bit into exploit territory, you can begin this quest, kill all the would-be warlords on the spot, then make your rounds and use Frenzy to get certain ones of the gang's intended victims (whose names you technically shouldn't actually be aware of) to attack you in turn. This way, you can kill the ones with powerful and/or valuable gear without incurring a Bounty, plus get the Warlords' manor. If you are not pursuing the quest to help the Warlords, what order you find the victims in makes no difference. If you don't want the Vacant Manor, you needn't even start the quest or interact with the Warlords at all, just take out the couple of non-talkative NPCs whose gear you want. Which will put your character in pretty much the same ethics boat as the gang; you're competing with them for the same loot. 10 I met Dovor Oren in a vacant manor house in Mournhold. He claims to be preparing for some sort of war between the Temple and the Imperials. 30 Dovor Oren has asked me to find Soscean in the Winged Guar, and get his sword and cuirass. I will have to kill him, which Oren assures me is the right thing to do. 40 I killed Soscean and brought his sword and cuirass to Dovor Oren, who paid me for the items. 50 I should speak with Felvan Ienith to see how I can help him. 60 Felvan Ienith has asked me to kill Elanande, and take her robe and axe. She should be somewhere in Godsreach. 70 I killed Elanande and brought her equipment to Felvan Ienith. 80 I should speak with Olvyne Dobar to see if she needs any equipment. 90 Olvyne Dobar has asked me to kill Bels Uvenim and retrieve his equipment for her. He should be somewhere in the vicinity of the Temple. 100 I killed Bels Uvenim and brought his spear and helmet to Olvyne. 110 Dovor Oren has asked me to bring him Suldreni Salandas' amulet and mace. 120 Finishes quest I have completed all the tasks that Dovor Oren required of me. 200 Finishes quest I have declined Dovor Oren's invitation to help him re-shape Mournhold. He implied that I shouldn't have any further contact with him. 210 Finishes quest I have killed Dovor Oren. 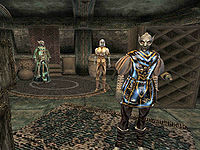 10 Felvan Ienith told me that Dovor Oren gained his wealth illegally, stealing from Mournhold's nobility. 20 I have convinced Felvan Ienith to consider turning himself in for his crimes, before anyone else gets hurt. 30 I have convinced Olvyne Dobar to consider turning herself in for her crimes, before anyone else gets hurt. 40 I found Dovor Oren dead in the vacant manor in Mournhold; his fellow conspirators are nowhere to be found. 50 Finishes quest Felvan Ienith and Olvyne Dobar turned themselves in for their crimes. Apparently they killed Dovor Oren when he attempted to stop them from going to the authorities. They have not implicated me in any way.